We offer a broad range of prefabricated in stock parts you need to keep your business moving! Atlantic’s Elastomeric Process offers molding techniques in a wide selection of elastomers. Atlantic has thousands of molds for parts to meet or exceed standard commercial tolerances. Over 90 years of experience in custom molding, plus total capability in materials and precision, make Atlantic the right choice when you need a unique part. Mechanically protects against the sharp edges of drilled or punched holes for wiring, cable, tubing, piping, hoses, air lines, rope and more. Used in appliances, motors, tools, cars, trucks, trailers, electronic equipment, toys, bikes, RVs, boats, pumps, furniture and more. Sometimes called Button Bumpers or Push-in Bumpers, they come in two styles: round-headed or arrow-headed (pointed). Used extensively in automobiles, trucks, appliances and door frames, the ease of installation makes these very popular with metal fabricators in all industries. Also used to prevent metal-to-metal or surface-to-surface contact in door jambs, behind doors, between moving parts, and in applications where push-in parts work better than metal fasteners. T Shaped bumpers are ideal for applications where holes are in thick materials, installation requires “friction fit” parts or parts are installed with an adhesive. Stem bumpers are extremely useful. Unlike recessed rubber bumpers, stem bumpers do not require additional fastening parts. Our selection of stem bumpers includes rounded heads and chamfered stems. Recessed Bumpers are used as feet on the bottom of products, on the side as protectors, and on the top as absorbers. They are offered with or without metal washers, depending on the application. They are primarily used to prevent metal-to-metal or surface-to-surface contact. Common uses include counter-top appliances, door stops, cart edges, furniture feet, drawer stops, and thousands of places where they are installed with fasteners to protect metal and wood. Rubber washers and spacers have great utility to help reduce noise, vibration, electrical current, etc. We carry an array of these parts in both sponge and rubber materials. Rubber bushings absorb shock and reduce vibration. Here at Atlantic India Rubber, we have a selection of rubber bushings and washers in our warehouse. A variety of these we supply are custom made, and we are capable of attaining many other specifications that will meet your custom needs. If what we have does not satisfy you, contact us and we will do our best to find what you are looking for. We have access to a variety of vacuum products and suction cups. We currently carry single cup lifters, double cup lifters, grabbers, 2 finger grabbers, straight handle lifters and replacement cups. All of our vacuum products come in several sizes so they can best satisfy your needs. We also manufacturer small suction cups with machine screws for appliance feet and other applications. See catalog for examples. We stock several sizes and makes of both rubber tips and caps. Cane/crutch tips and lab stoppers are also available. We are an authorized distributer of the 3M bumpon products. We also carry military grommets to MS35489 specifications. Let Us Make Something for Your Company! 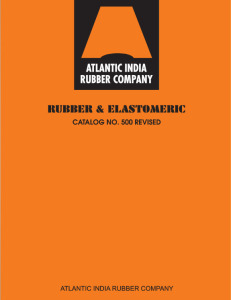 Atlantic India Rubber Company serves a wide range of OE manufacturing and MRO industries with an extensive line of “off the shelf” mechanical rubber shapes. Over 14,000 standard shapes are able to be handled without a tooling charge.